Lilttle is known or published about the Chelmsford Steam Car. "The company exhibited two cars and a van at the 1903 motor show. They were made at the Moulsham Works in Chelmsford. Chelmsford also built many steam buses." It was apparently in business from about 1901 to 1903. 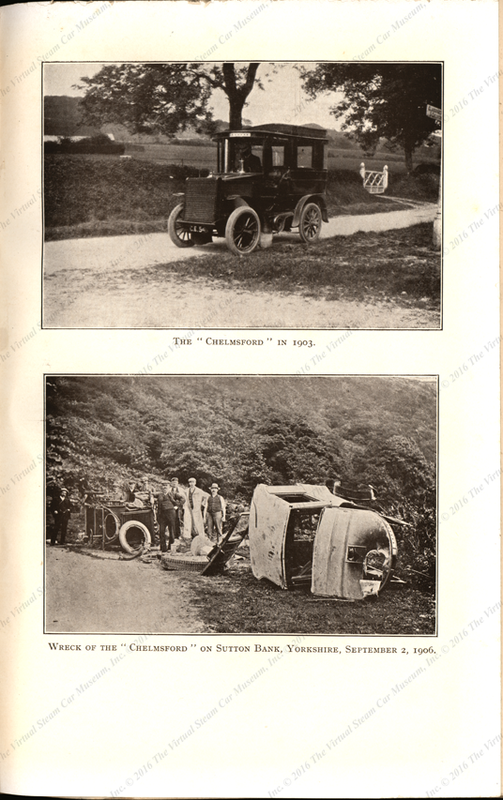 Major P. M. Stewart wrote about his travels in early automobiles, including his Chelmsford Steam Car, which he crashed. Read his account. Wikipedia. See also: Lord Montagu of Beaulieu & Anthony Bird, St. Martin's Press, Inc., 1971. "Appendix A". Steam Cars 1770–1970: 215–221, and Kennedy, Modern Engines, III, pp. 195-205, both cited by Wikipedia. Contact us if you have additional information about the Chelmsford Steam Car or if you have questions.